Welcome to summer in Pono! On Monday, Poppy Luca took us on an artistic journey to ancient Egypt! She shared images of ancient Egyptian sculptures and the children then began sculpting their own terracotta figures. Clay goddesses, dragons, jackals, and cobras soon took shape and joined other imaginative designs on the tarp. The children delighted in working with the natural clay and enjoyed the creative process. Our favorite wrestling teacher, Jon Burgos, visited on Tuesday and set up an agility ladder for the children to work on their footwork. This also challenged the kids’ muscle memory with patterns they wouldn’t usually encounter on the playground or in other exercises. 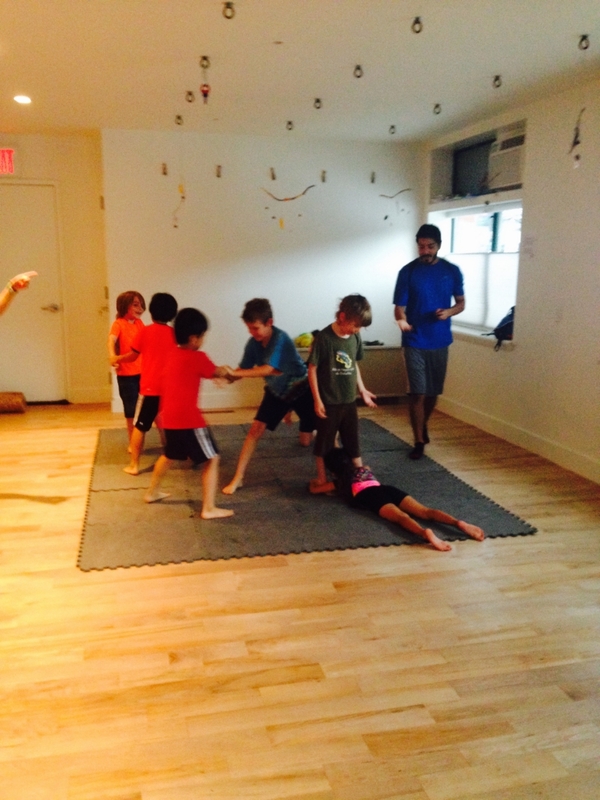 The children then practiced basic wrestling skills, including stance, shooting (standing and going to grab the other person’s leg), sprawling, and spinning, and Jon went over breakdowns and escapes. As always, Jon emphasized kindness and cooperation while wrestling. Thursday, Julia Foote invited our littlest Pono friends to dance and one child requested “Uptown Funk” to get our Pono dance party started! Julia also brought her guitar and played and sang with the children. They helped her compose verses for “Old McDonald” (Who knew seahorses, cheetahs, and humpback whales lived with the cows and sheep?!) and “The Rattlin’ Bog.” The children especially enjoyed using a guitar pick to help Julia play chords. Our first day of summer term was especially sweet! We headed to the lawn in Marcus Garvey Park, where the children literally had a ball shaking, tossing, and kicking ice-cream balls filled with ice, salt, honey, almond milk, and assorted fruits. Making the ice cream was hard work, but it tasted that much yummier when it was finally done! 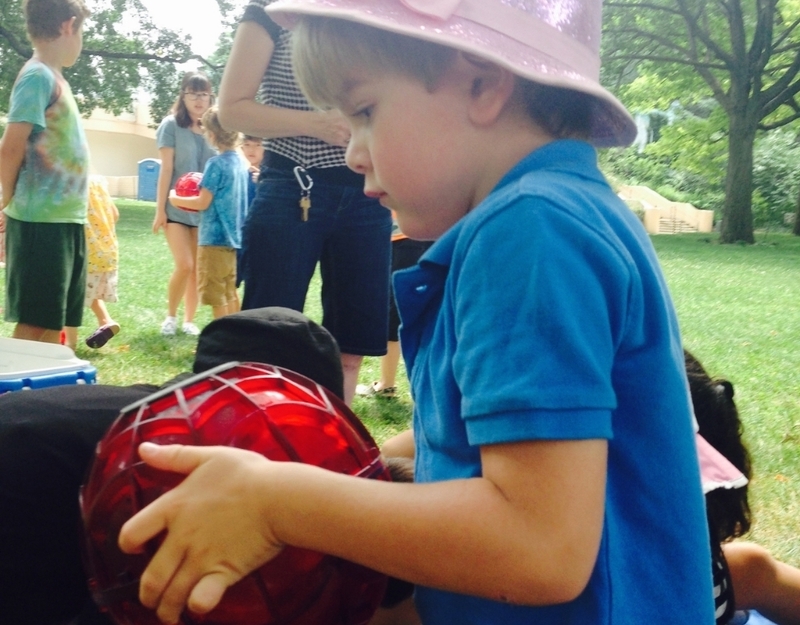 On Tuesday, Kate brought bubbles and a variety of wands in different shapes and sizes to Marcus Garvey Park. The children enjoyed experimenting with the different wands and chasing after the shimmering bubbles. We ended up getting caught in a downpour, but that didn’t dampen anyone’s fun! One child exclaimed, “Best day ever! Bubbles and puddles!” Several children danced and sang in the rain, declaring it a rain festival, a reminder that outdoor education can happen rain or shine! In Literacy with Julietta this week, Pono's younger children refreshed their sight word memory and continued making imaginative pages for their "His" book. Without revealing too much, this book will involve many small mysteries to be solved. Meanwhile, the older children took a break from writing their nonfiction pieces to have some fun in their word families book, playing games with the words from their short a and short e word lists. In Math and Cooking with Maysaa, the children lined up popcorn kernels and estimated the length of the lines using the length unit of their choice (inches, feet, centimeters, or meters). They then used measuring tapes and discovered all of their estimates had come up short! The corn kernels soon ended up in the popper and the children made unique popcorn seasonings with a variety of ingredients, including coconut oil, cinnamon, paprika, honey, dried cranberries, and goji berries. There was no need to estimate how much popcorn would be left over—the children ate it all up! On Thursday afternoon we took advantage of the beautiful weather and headed to Marcus Garvey Park for a game of freestyle soccer! We all took turns passing the ball and racing across the grass. Julietta also invited children for some outdoor literacy time, so our afternoon had the “3 Rs” —Reading, Writing, and Running! On Wednesday, we ventured out to Brooklyn to visit the horses at Jamaica Bay Riding Academy. We arrived in a rainstorm, so the children took turns riding Pattycake, the appropriately named Rain, and Jack Daniels in the Academy’s indoor arena. Afterwards, one of the Academy’s riders gave us a tour of the stables. Our energetic guide engaged the kids with fun facts about the horses and their personalities. She explained where the horses sleep, how to prepare them to ride, and how to feed them. She then gave the children hands-on experience grooming one of the horses. It was hard to say goodbye to our equine friends! Pono was closed this Friday in honor of the Eid al-Fitr holiday. Comic Book Friday will return next week!